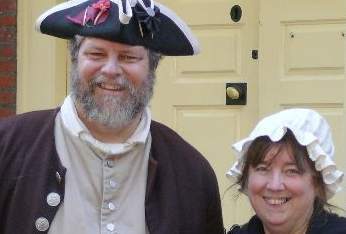 John and Jan are Darby, PA residents who have a great interest in history, music, and the environment. As former co-presidents of the Darby Creek Valley Association, they have a great concern for various issues affecting water quality in the creek, which flows from Chester County into the Delaware River at Tinicum, south of the Philadelphia International Airport. To help publicize the problems of stormwater runoff and promote better stormwater management, they have written new lyrics to a number of popular songs, which they have graciously allowed me to post below. Please be aware that all lyrics are Copyright © 2010 by John Haigis. To see a slideshow of images of Darby Creek (looking pretty and gentle as well as mean and overflowing), over which Jan and John sing a couple of their stormwater songs, click here, or see the embedded YouTube video below. Let it soak into the ground. Help the water to flow. Tune: My Favorite Things from "Sound of Music"
And oh how we wish wed planned. Tune: Consider Yourself from "Oliver"
Consider it all up to us.